“PORGY AND BESS was not unappreciated at the time of its première in 1935. Unconventional for its time, it required the passage of time to be seen for what it is. This two-disc set gives us the opportunity to do just that. Nearly three-quarters of a century after Gershwin, together with with his brother, Ira, and the author DuBose Heyward, created it, PORGY AND BESS has now acquired a lustre that for a time was buried in its core. One of the most revealing reviews of this musical saga of South Carolina’s Catfish Row was delivered by the composer and critic Virgil Thomson on the show’s revival in 1941, four years after Gershwin’s death. He wrote, ‘PORGY AND BESS is a strange case. It has more faults than any work I have ever known by a reputable composer. There are faults of taste, faults of technique and grave miscalculations about theatrical effect…. [Gershwin] didn’t know much about aesthetics and he couldn’t orchestrate for shucks; but his strength was as the strength of ten because his musical heart was really pure’. The present release also contains purity. 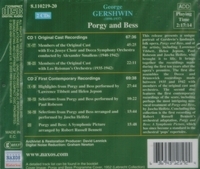 It presents recordings of PORGY AND BESS made immediately after its unveiling and for the first ten years of its life. It enables the listener to go back to that time. With these recordings restored and gathered together for the first time, revisionist history can be eliminated and it is possible to imagine how the score would have sounded to listeners of the 1930s and 1940s. 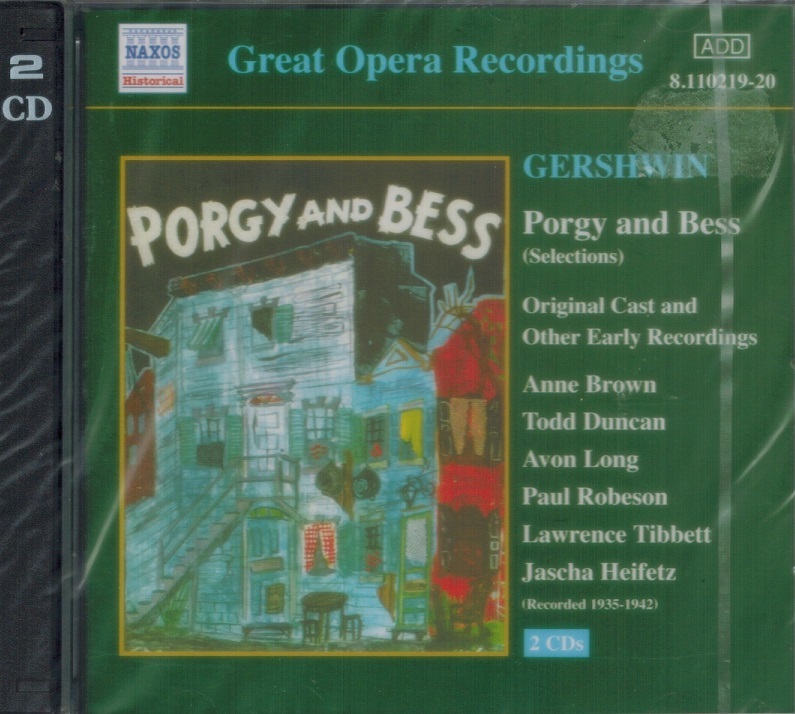 Listening to other works of this period will only help reinforce the unconventional nature of PORGY AND BESS. While Decca had many of its popular artists record the songs in a disjointed fashion soon after the show’s opening, the label waited five years before attacking the work in a major way. The wait was worth while. 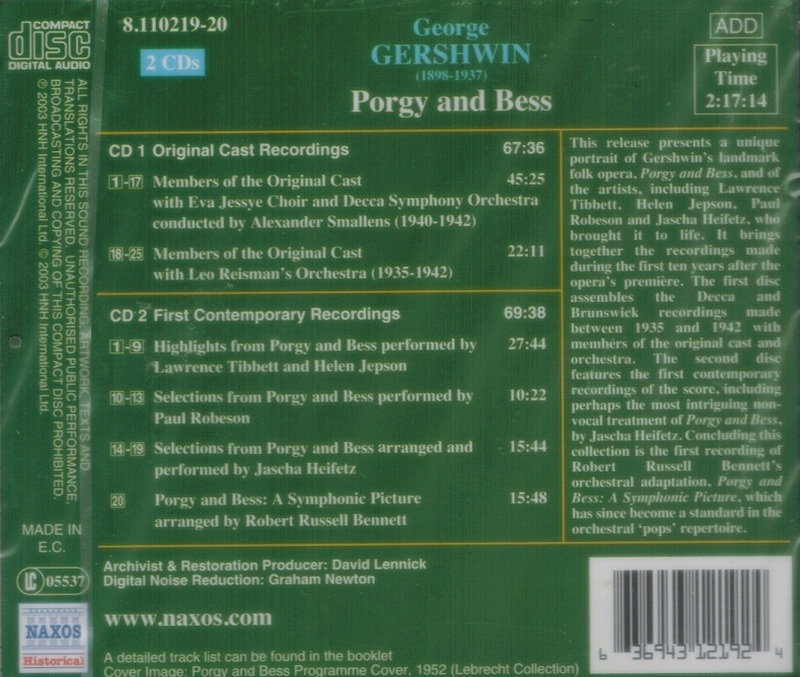 PORGY AND BESS was Decca’s first original cast album, recorded in 1940, long before OKLAHOMA!, which is commonly regarded as the first original cast album. Earlier albums, such as SHOW BOAT and THE BAND WAGON, used cast members with studio or dance orchestras, not the original pit orchestras. For the four 12” discs, Decca brought the cast members Todd Duncan, Anne Brown, the Eva Jessye Choir and the conductor Alexander Smallens into the studio to record what turned out to be Volume One only. The three 10" sides for the second volume were recorded in 1942 following the show’s west coast revival and included the members of that production. The second disc features the first contemporary recordings of the score. It begins with what were actually the first commercial recordings, as well. These were the set of highlights made by Victor with the Metropolitan Opera stars Lawrence Tibbett and Helen Jepson, under the direction of the show’s original conductor, Alexander Smallens. While the racial content of PORGY AND BESS was criticized by Duke Ellington at the time of its début, the great artist and social activist Paul Robeson had no qualms about the work. He gladly recorded four of the show’s songs for HMV during his period of English activity in the mid-to-late 1930s. They serve only to remind us of the vibrancy and depth of this sensitive singer. Perhaps the most intriguing non-vocal treatment of the PORGY AND BESS score was that of Jascha Heifetz. As previously mentioned, he was a great fan of Gershwin’s and lamented the fact that many of his contemporaries were late in joining him in his admiration. In 1945, he arranged and recorded six selections as part of an all-Gershwin 78 rpm set which also included the Three Preludes. These superb Heifetz sides offer proof that the works deserve rediscovery by contemporary violinists and performance in the recital halls of the 21st century.